Five countries in Asia are preparing for the arrival of US President Donald Trump. Japan even presents a special entertainment when entertaining the number one in Uncle Sam's country. 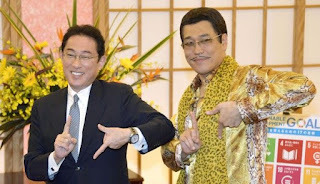 In the State of Sakura, Trump will be entertained by sensational pop singer, Piko Taro (44). The man whose real name is Daimaou Kosaka is worldwide through his Pen-Pineapple-Apple-Pen (PPAP) song. As quoted from The Guardian, Monday (10/30/2017), Piko will sing in front of Trump and Prime Minister Shinzo Abe when both dinner in Tokyo on Monday, November 6, 2017. The song PPAP successfully ranked 1st on the Billboard Japan Hot 100 charts and recorded as the shortest single to fill the position. Previously, PPAP managed to "bewitch" the Trump family. In November, the video of Trump's granddaughter, Arabella, who was singing PPAP became viral. The moment coincided with the visit of Prime Minister Abe to Trump who was then elected president. Kyodo News quoted an unnamed official, saying that with the entry of informal events on Trump's agenda of visits to Japan reflects a strong relationship between leaders of both countries. While visiting the US in February, Trump entertains Abe to his luxury resort in Mar-a-Lago, Florida, and both golf. According to Kyodo News, Prime Minister Abe who has an "efficient relationship" with Barack Obama wants to keep "optimism" during Trump's visit. Although on the other hand it can not be denied that the tension on the Korean peninsula triggered by North Korea's missile and nuclear program has not subsided. In Japan, Trump is also scheduled to play golf with PM Abe and Hideki Matsuyama, the world number four golfer. Trump is also scheduled to meet Emperor Akihito and Empress Michiko and the families who were victims of North Korea's abduction during the Cold War. In addition to Japan, Trump will travel to South Korea, China, Vietnam and the Philippines. Trump's visit is scheduled to take place from 3 November to 14 November.